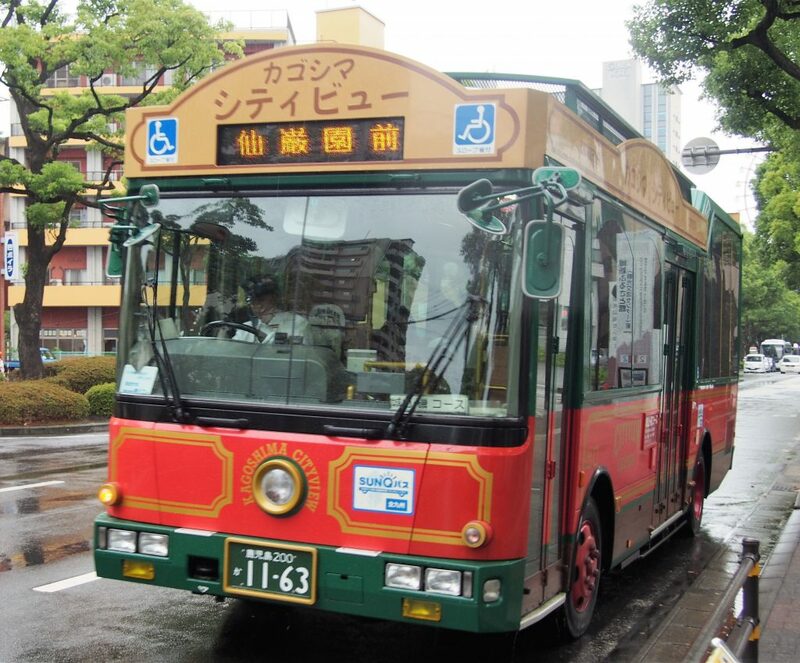 Kagoshima City View Bus – Enjoy Sightseeing at Kagoshima City – | Kagoshima Love! Very convenient transportation for sightseeing main travel spots in Kagoshima City. I have been born and raised in Kagoshima Prefecture, but it was my first time to board the Kagoshima City View Bus. I had thought that many seats of the bus would be vacant, but I found that the bus was full of local people and foreign tourists! It was the middle of summer (the end of the July) and many childredn was on the bus to enjoy swimming at Iso Swimming Beach, which is the one of the destination of the bus. Seats were desighned so that passengers can enjoying viewing outside. Seats of the rear side of the bus were removed so that passengers can stand there to enjoy seeing city view. You can listen to the guide announce which explains the each main spot in various languages. I thought that I would never feel bored inside the bus. The bus is popular among local people of Kagoshima city and tourists. I hope that many people will make use of it. There are 3 courses “Shiroyama / Iso Course”, “Water Front Course” and “Night View Course”. The bus circles clockwisely in Kagoshima City in 60 minutes. 17 buses operate everyday. I made a map of Shiroyama / Iso Course. Click on each marker takes you to the article of the travel spot. The bus circles counter-clockwisely in Kagoshima City in 75 minutes. You can visit the almost same travel spots as Shiroyama / Iso course (the bus visit the Saigo Nanshu Museum). The bus departs Kagoshima Chuo Station for Shiroyama Observatory, where you can watch the beautiful night view of Kagoshima City. The bus operates twice a day (departure time 19:00 and 20:00) in Saturday. Adult 190 yen, Children 100 yen. Please pay the fee when you get off the bus. If you buy a 1 day ticket (adult 600 yen, children 300 yen), you can get discouts at the following facility. You can bu a 1 day ticket on the bus.